Shrub trimming and pruning helps your trees and shrubs stay healthier and should definitely be done when there are branches that are diseased, dead, pest-ridden, or brushing against each other or any structures on your property. Pruning at the wrong time will not hurt your trees or shrubs, but it can interfere with their flowering or fruiting. Landscaping professionals will know the best times to prune for all of the plants on your property to maximize their beauty and health. 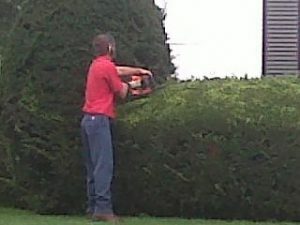 There are many and varying techniques, tools, opinions, budgets, goals, and perceptions when it comes to correct pruning and shrub trimming, all of which Bykerk Landscape Management will customize for you. Call us at (616) 698-7263 to schedule your annual or biannual trimming.